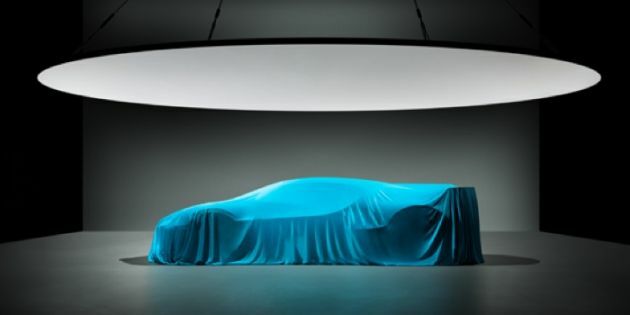 Here’s another teaser of the upcoming Bugatti Divo, which is set to make its debut later this month. We’ve already seen bits and pieces of the French automaker’s new model, but this is the first time we see its covered silhouette? If it looks familiar, you’re probably thinking of the Vision Gran Turismo from the 2015 Frankfurt Motor Show. That concept arrived well before the Chiron came to light, appearing a lot like a track-focused machine, which you can drive in Polyphony Digital’s Gran Turismo Sport video game. Vehicle highlights based on the image include a large rear wing, very prominent wheel arches and a strong line that runs from the front wheel to the B-pillar. The last item also appears to overpower the ‘Chiron line’ that is present on the company’s current flagship. Bugatti has already stated that the Divo will have outstanding handling properties and the dynamic character of the car will be underlined by a new, strong design language. This new shape is a clear sign of this, but it will also deliver high levels of aerodynamic performance. Other touted enhancements affect the engine, with reports saying the Chiron’s 8.0 litre quad-turbo W16 engine will be mated to a bespoke, motorsports-derived gearbox from even faster acceleration. Coupled with more weight-saving initiatives, the usual performance figures should be improved from the Chiron as well. More details will be revealed during the Divo’s official unveiling, with production being limited to just 40 units, each carrying a price tag of five million euros (RM23.4 million). The latter is a lot more than a Chiron or Chiron Sport, which are a lot more “common” with 500 total units planned. The post Bugatti Divo gets teased yet again before official debut appeared first on Paul Tan's Automotive News.